The FE-CBT Chemical Exam measures skills that are considered essential for success in engineering and is an important factor in securing a P.E. License. There are a few options to register for a course. You can register online, over the phone at 713-529-9752, or you can print out the registration form, fill it out and either fax to 713-529-4394 or mail it to our office. Why choose a FE-CBT Chemical course? Testmasters offers a guaranteed pass. Testmasters guarantees that any students who enroll and take the Testmasters FE-CBT Chemical course will pass, if the student attends all classes and does the required coursework. If the student doesn’t pass, they may take the next course absolutely free. Testmasters has 20 years of experience, preparation materials, and methods. Years of research and experience has helped Testmasters create the most comprehensive exam preparation guides. 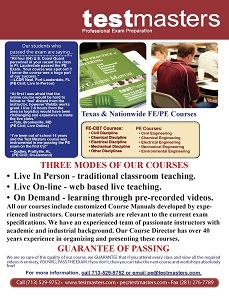 No one knows the FE-CBT Chemical better than Testmasters does. The Testmasters instructors have years of experience and are required to repeatedly take all of the same tests that students are preparing for. Testmasters puts its teachers through a rigorous selection and training process before they can set foot in a classroom. Ongoing training and development, as well as taking the same tests repeatedly, are the secret to their success. If anyone knows results, it’s Testmasters. We’ve been helping students achieve their goals since 1991, and guarantee customer satisfaction. Review Courses: Theoretical concepts are explained to refresh and give students an understanding of important exam topics, and many examples and worked to reinforce these concepts to develop the student’s problem-solving proficiency. Problem Solving Workshops: The workshops, which give intensive problem-solving practice, supplement the review courses. 100% of the time is devoted to strengthening students’ proficiency in solving exam-like problems in a timed environment, similar to what will be experienced on the actual exam day. Full-time undergraduate students will receive a 50% discount off the regular fee when taking the Testmasters FE-CBT Chemical course with workshops. We will need a copy of your fee slip from the registrar’s office showing that you are enrolled in at least 12 credit hours in the current semester. No additional discounts will be given. If you are unable to start the Testmasters FE-CBT course, the fee will be fully refunded. After the course begins, refunds will be given on a pro-rata basis up to a certain time period less $150 administrative fee upon a written request for a refund. Please review the refund policy for your course location carefully. There will be no refund for the classes missed or attended prior to our receipt of the written request, which must be sent by email to engineering@testmasters.com. No refund will be given for the workshop fees once they begin.